No, not at all. 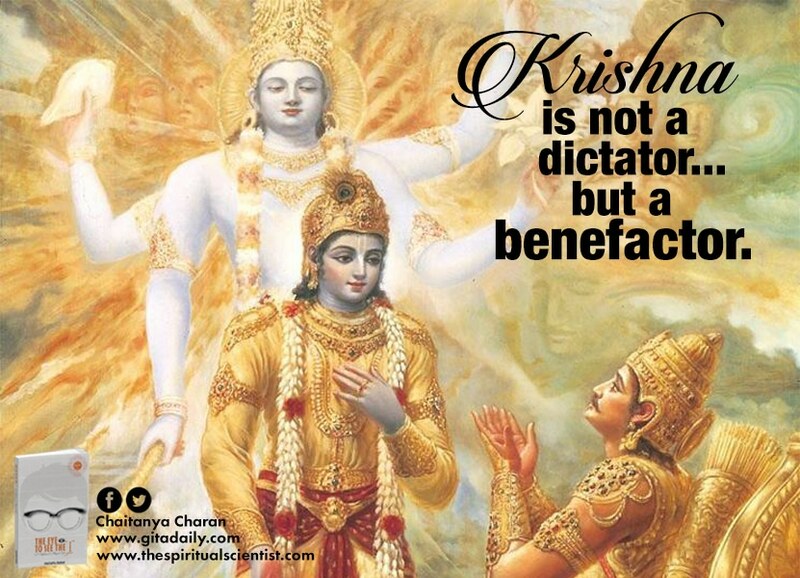 Far from being a dictator, Krishna is our benefactor, in fact, our greatest benefactor. To see him thus, we need to understand scripturally both his position and his disposition. The Bhagavad-gita (04.06) asserts his position as the Lord of all living beings, and points to his disposition by stating that he appears in this world to promote our wellbeing. Our wellbeing and happiness are inextricably connected to our relationship with Krishna. Though he is our Lord, our relationship with him is not artificially imposed, like that of a dictator and a slave, but is organically composed, like that of a whole and a part, as the Gita (15.07) indicates. Just as a finger is nourished by offering food to the stomach, we become nourished with happiness by offering service to Krishna. If the finger refuses to nourish the stomach, it stays malnourished. Similarly, if we refuse to serve Krishna, we stay unfulfilled. It is to end our feelings of incompleteness that Krishna descends to this world. He descends not just to establish social order (04.07-08), but also to restore spiritual harmony between him and us. We attain spiritual harmony when we become attracted to his wondrous personality, learn to love him and thereby attain him for a life of eternal love (04.09). As a part of our learning to love Krishna, we express our love through service, for service is a universal expression of love in any relationship. When we re-envision service to Krishna as an expression of affection, not a symbol of subordination, we can get rid of resentment and relish the sublime joy latent in devotional service. Excellent explanation of the verse Prabhuji. Our satisfaction stays in serving the Lord.